Cheesecake is a cold dessert made from a biscuit base and a topping made of fresh cheese cream sweetened and processed with other ingredients. Base is made up of crumbled biscuits re-knead with the addition of butter, or even the base can be made of sponge cake or pastry. Cheesecake has Greek origins, in fact in 776 BC, during the first Olympics in history, it was served as a dessert to the athletes. Then the Romans spread it throughout Europe and centuries later it also spread out in America thanks to immigrants. The real cheesecake requires the use of Philadelphia, the famous cream cheese, created in 1872 by the American dairyman William Lawrence. In 1880, it was given the name of "Philadelphia", since the city was considered the place where food products were of better quality, and also began the spreading of the product around the world. You can also use other fresh and very soft cheeses such as ricotta and mascarpone to make a cheesecake. Moreover, the recipe is often enriched with fresh fruit, candied fruit, nuts or chocolate and can be enriched with cream and fruit toppings making, from time to time, many different decorations. 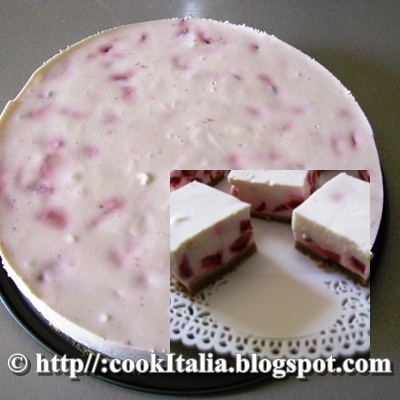 Cheesecake can be generally classified into two main types: cooked and uncooked. There are several versions produced in different countries where the dessert has spread, the greatest cheesecake makers are located in New York. Prepare the biscuits base: finely crumble the cookies (photo 1), mix them with the melted and tepid butter (photo 2-3), distribute them by pressing down with a spoon (photo 4), in a 26 cm (10.24 in) in diameter round cake mould that can be opened (with the hinge at the side) covered with baking paper (photo 5). Put it in the fridge the time it takes to prepare the cream. Prepare the cheese cream: Rinse strawberries and cut them into small pieces and set them aside. Soak gelatin leaves in cold water for 10 minutes. Meanwhile in a mixing bowl, mix Philadelphia with sugar and lemon juice (photo 6-7). Warm up the milk, remove from the heat and dissolve in it the squeezed gelatin leaves (photo 8). Add it to the Philadelphia mixture (photo 9). Let the obtained mixture cool in the fridge until it begins to thicken, then gently mix in the whipped cream (photo 10) and, in the end, the strawberries (photo 11). Pour the cream on the biscuit base (photo 12) and let it set in the refrigerator for at least two hours (photo 13). You can decorate the cake with whole or cut in halves strawberries, with jam or, as in my case, simply cut it into squares (photo 14) and serve.